Like all true Mancunians, I love Vimto - so much better than that Ribena stuff, which is only fit for Southern softies. So imagine my delight when I got a commission from one of the Vimto family to paint a poster which reflects the company’s unique appeal not just in Manchester but across the world and especially in the Middle East. The company was created by the Nichols family in Manchester, and remains in the family to this day, hence the headline Nichols and dimes to show how successful it has been. Here is me presenting the framed poster to Vimto’s Commercial Controller James Nichols at the company’s headquarters in Newton-Le-Willows. Thanks to the lovely Mel in Pop Boutique on Oldham Street for being my model - another true Manc from Ancoats. Start of the Great Northern Warehouse experience! When Lawrence and Rebecca Cray came to buy some posters off me at Urmston market, they couldn’t make up their minds about which ones to buy. They had lived in Worsley and Eccles, and also close to the Mancunian Way. Now they were living in Urmston. I’d done posters of all those places, even one featuring the Mancunian Way, but they were torn. So hey, bingo, they thought they would have all four in one! The Result is the Manchester Odyssey of the Crays, where I’ve melded all four posters into one with new typography. The poster is now taking pride of place in their living room above the fireplace. So now you know - if you want anything bespoke, just ask. I can’t change the background images but I can do anything with the words. Here is the finished result and all the original posters. All this weekend we are at Altrincham Market. Exciting news for Statement Artworks. I am one of the first artists in the country to be signed up to the Co-op's brand new local.co.uk website, which is now live (www.local.co.uk). Manchester is the pilot city but the site will soon be rolled out across the country. Watch me being interviewed by the Co-op (https://www.youtube.com/playlist?list=PL9gVDiqd8VQyC8Q5HD7XlZ4H_ViTHMmEf). Most of my images are on the site, in A3 poster and A4 mount options, and you can buy directly through the Co-op. You can buy from me still at markets, and this weekend I am at Stockport and the Northern Quarter, while on Tuesday I have a stall at Victoria Station. 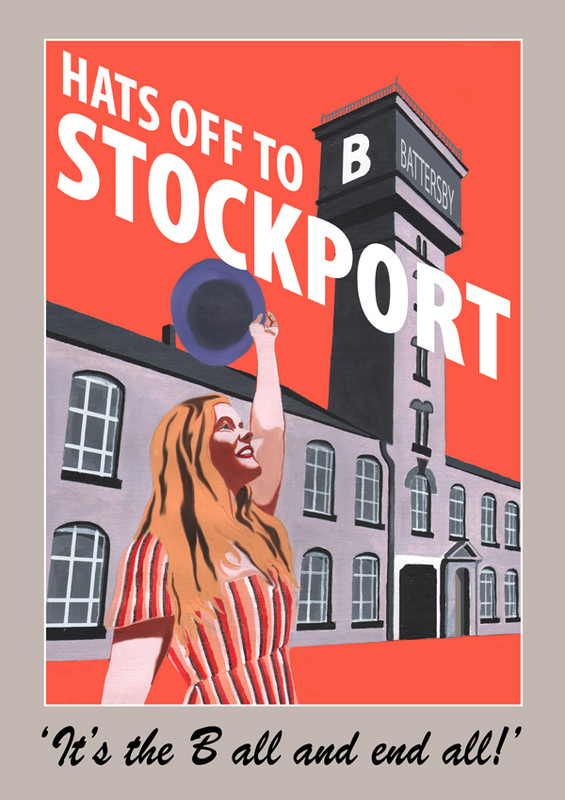 My two latest images will be on sale, plus an adaped version of my Offerton poster, which now has Stockport as the banner. That, along with lots of other images, will soon be for sale at the Hat Works Museum in Stockport and at Staircase House. Man City - bitter Blue? Make a statement with your art! The commission was to do three posters for a local estage agent without being boring or corporate, and getting in a little joke too. Well if you live in Bramhall, Cheadle Hulme or Hazel Grove you should appreciate these works - which will be used by Snapes estate agents in their summer promotional material. 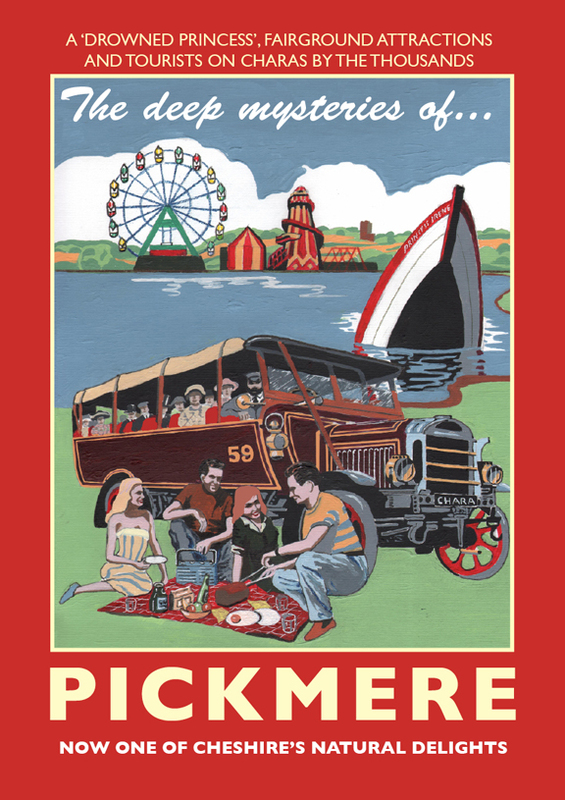 I've also just finished a commission for Pickmere near Knutsford, which was once THE destination for working class families from Manchester looking for some Cheshire weekend fresh air in them there olden days. There used to be a funfair, pleasure cruiser and rowing boats on the picturesque lake, plus lots more. The poster sort of tells the story. Now it's mostly returned to nature, but there's a great cafe and fun events from May to October. The poster, along with cards, magnets, mugs and mounts, is available to buy at the cafe, or directly from me. Curve appeal of Cheadle Hulme. The sun always shines in Hazel Grove. Pickmere - charas came by the score. Two great lads who admitted to being 'economic refugees' from Hale and have bought a more affordable house in Urmston, commissioned me to do a special personalised poster. And with a few tweaks of my Urmston poster, Neal and David got their very own bespoke framed version for their new home. If you fancy a personalied poster, based on any of my images (over 45 and counting) then just contact me on statementartworks@gmail.com. Check out the full range of my work at www.statementartworks.com. My posters are all about the people and places of the north, with a heavy dose of fun thrown in, and I just love adapting them to feature names, streets, whatever you like. 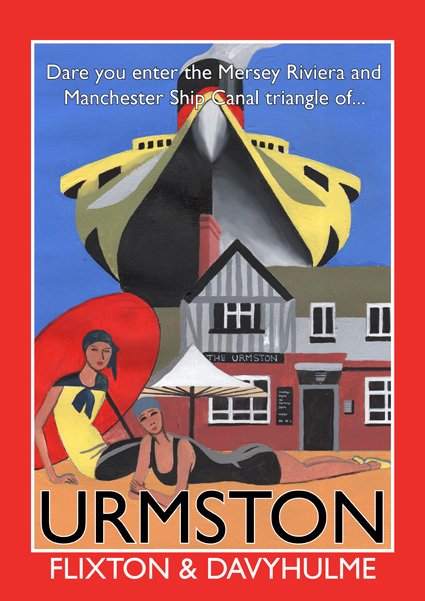 Here are the two versions of the Urmston poster. This Sunday we are doing the West Didsbury Makers Market and Treacle Market in Macclesfield. See you there. Good to be in central Manchester again, and two of my latest posters will definitely be on sale - the manifesto and the Mancunian Way. This weekend I am at Stockport Market on Saturday and Altrincham Market on Sunday, and with the weather forecast being so good, there's no excuse for not coming to say hello and wishing me a happy birthday. 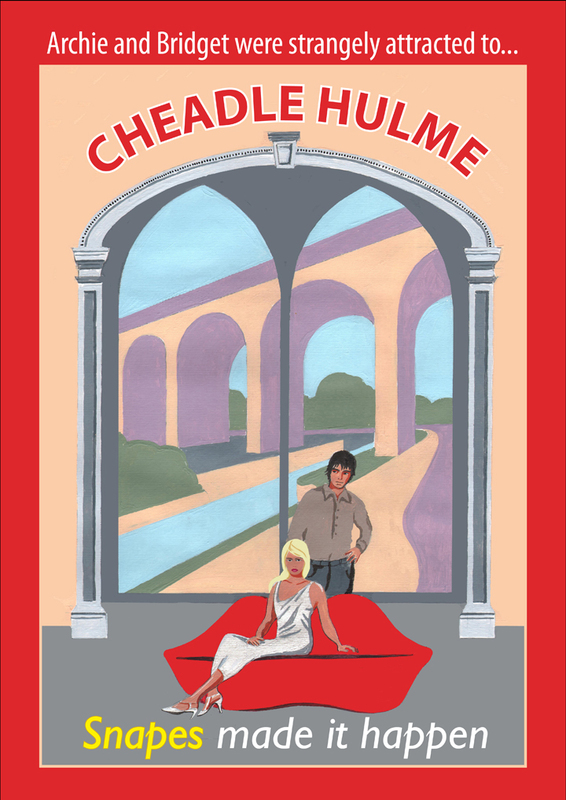 Which reminds me, I've got a new set of birthday cards, adapted from my Mancunian Way poster (attached). Every birthday boy and girl should receive one! Stretford, Altrincham and the Mancunian Way...a hat-trick of cheeky posters! Get your skates on...down to Altrincham market! Skating, in late March...quite possibly! Here is my Manchester Manifesto, contained in my latest poster (see below). Forget the left, the right or the centre, if we followed this path, everything in the world (well, south of Preston and north of Macclesfield) would be just dandy. So stick that in your London-centric pipes, Corbyn and May, and smoke it. The Manchester Manifesto is on sale, along with my newly-adapted Mancunian Way birthday card (also below), at Altrincham Market on Friday, Saturday and Sunday over Easter, and at Knutsford Market on Sunday. See you there. Birmingham, England’s second city? You’ve got to be joking. Half an hour off the train journey to London – who cares? Of lazy London-centric media folk who use ‘grim’ or ‘oop’ whenever they refer to the north. Eccles or Chorley ones, please. It’s either King Colin of Bell or King Eric of Cantona. ALL STAND FOR THE MANC ANTHEM! Station Approach by Elbow, an ode to Piccadilly, the gateway to the best city in the world. Those Yorkshire folk have got to be stopped migrating over the Pennines to civilisation somehow. No child shall be encouraged to support Liverpool. Ever! Same goes for Leeds United and Chelsea. In honour of Tony Wilson, our late spiritual leader. Recognise the right of the trendy enclave to operate entirely according to its own liberal, yoghurt-knitting, vegan agenda. Build its new parliament as an extension to the Unicorn co-operative vegan superstore. Old Toms all round, on prescription! The beer, one of Greater Manchester’s strongest and produced by Robinsons Brewery, is laughing juice and after two you’re barely stable. So lovely though. RISE UP, MANCUNIANS AND PARTY! Nothing new there, but let’s not do any more of that 24-hour stuff. Let’s call a truce with our nice Scouse neighbours over in Liverpool. Don’t like that idea? Well just calm down, calm down. There's the left, the right or the centre. Then there's bang on! 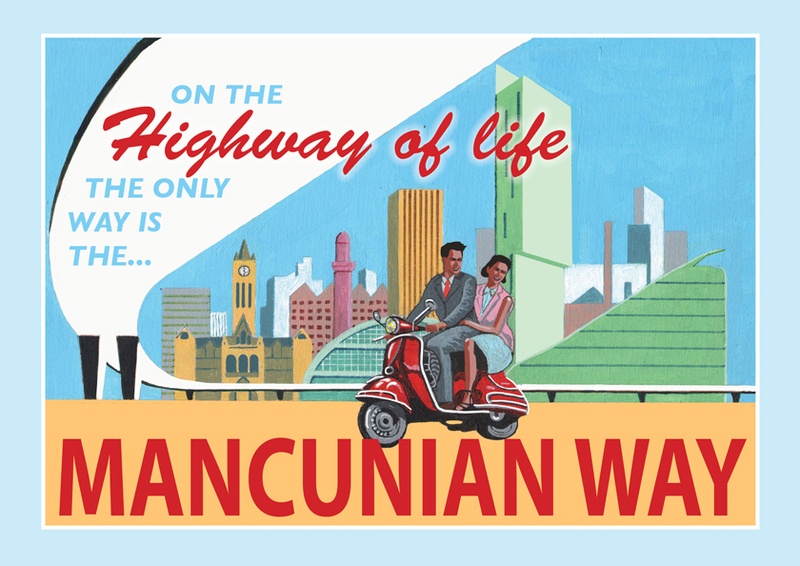 Coming soon - the Mancunian Way birthday card! I got really angry with a feature in the Daily Mail recently about the Labour Party and the North. It used a picture of mills and chimneys belching smoke, probably taken 70 years ago. Anyway, that, and other similar southern-centric rubbish that depicts northerners as backwards cloggies living in squalor has inspired me to do my latest poster, the Manchester manifesto.